Pride Mountain Vineyards is located 2,100 feet up on Spring Mountain. The vineyards have been around a long time. In fact, they date all the way back to 1869. Archived records show the property was already being used for the production of wine at the time. The original structure was destroyed by fire after Prohibition. 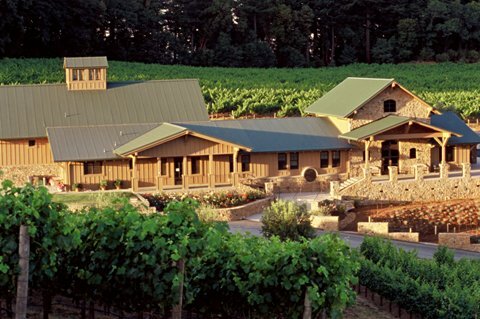 Pride Mountain Vineyards finished construction and a complete renovation of their estate in 1997. Pride Mountain Vineyards owns three vineyards which add up to 235 acres on Spring Mountain in the Mayacamas mountain range. Their high elevation gives them an advantage over growers located further down the mountain. The soil includes volcanic rocks, gravel loam and stones along with some clay. They grow Cabernet Sauvignon, Merlot, Cabernet Franc, Petit Verdot, Syrah, Petit Sirah, Chardonnay and Viognier. Pride Vineyards practices sustainable farming techniques. After harvesting, Pride vinifies all their vineyard lots separately. They own 40 different blocks which comes to being fifty lots of wine that are produced each to their own needs. The percentage of new French oak varies from vintage to vintage. Pride Mountain Vineyards produce a myriad of different wines and bottling’s including Cabernet Sauvignon, Claret (a Bordeaux styled, Merlot, Cabernet Sauvignon blend), Merlot, Viognier, Syrah and Petit Sirah. Pride Mountain Vineyards wines are best served at 15.5 degrees Celsius, 60 degrees Fahrenheit. The cool, almost cellar temperature gives the wine more freshness and lift. Young vintages of their red wine can be decanted for 1-3 hours, depending on the character of the vintage. This allows the wine to soften and open its perfume. Older vintages might need very little decanting, just enough to remove the sediment. The red wine of Pride Mountain Vineyards is best served with all types of classic meat dishes, veal, pork, beef, lamb, duck, game, roast chicken, ribs, hamburgers, barbecue, roasted, braised, grilled dishes and stews. Pride Mountain Vineyards is also good with Asian dishes, hearty fish courses like tuna, salmon, mushrooms and pasta. The white wine of Pride Mountain Vineyards is best served with all types of seafood and shellfish, sushi, sashimi, chicken, veal, pork and cheese. Crowd pleasing, easy to drink, but quite oaky, Once past the vanilla, smoke and coffee, the core of fruit is sweet and tasty. Ripe, forward, open and tasty, even if it's obvious. Loads of sweet, ripe, fat, juicy, berries, lots of oak, vanilla, plum and licorice are all over the place. Round and ready. A massive wall of sweet, ripe, powerful, black fruits, vanilla, smoke, licorice, chocolate, black and blue fruits just keep on coming. There is a lot to take in here as this is no shy, little sister. It is a powerful, forward, take no prisoners style of wine. Smoky, blackberries, olives and espresso bean scents create the aromatics. Soft, round and forward, the wine delivers black cherries, licorice and vanilla notes in the finish. Vanilla bean, licorice and juicy plum notes open to a medium bodied, round textured, forward wine that finishes with chocoalte covered cherries and espresso beans in the finish. Smoke, oak, earth, jammy cassis and coca scents lead to layers of chocolate covered blackberries and coffee flavors in the finish. Licorice, jam, blueberry, blackberry, vanilla and coffee scents pop the moment the cork leaves the bottle, Thick, concentrated, ripe and alcoholic, there is a touch of heat in the powerful, concentrated, forward styled, alcoholic, fruit filled finish. This style of wine is losing popularity with some drinkers. Fans of this style are going to like it a more than I did. I get he quality, but it's not fun for me to drink. Served blind, the wine offered tell tale ripe, California Cabernet Sauvignon scents of coffee bean, vanilla, jammy boysenberries and licorice with hints of blue fruits. At first, the wine felt hot. With time in the glass, it calmed down, fleshed and became more fun to drink. Coffee, licorice, blackberry jam, smoke and vanilla scents, full bodied and concentrated, this wine has not changed much since the day it was bottled. While it's well made, there is a lot of oak in this sweet, jammy, mouth filling style of wine. I liked the first glass, but we didn't finish the bottle. There is no hurry to drink this as it's not going to quickly fade away. It's a matter of style. Some people are going to like this style of Syrah a lot more than others. Big, rich and loaded with ripe, jammy black fruits, coffee and black cherry. Lush and round, but not overly complex, this is as good as its going to get. Still deep in color, with thyme, mushroom and dark berries in the nose. On the palate the wine offers a fat, dense texture and a finish with ripe fruit and oak, which is just a bit drying in the finish. A mountain of black and blue fruit roars from the glass. The dense, rich, concentrated wine fills your mouth with ripe chocolate covered berries. Is the wine any better with 10 of age, probably not. But with a big fat juicy steak, the wine works. Licorice, boysenberry and chocolate in the nose. The wine is soft, supple and ends with a fruit filled finish. 1996 Pride Reserve is packed and stacked with layers of ripe cassis, espresso, and fresh picked, jammy blackberries. This full bodied wine offers an intensity of flavor that does not overwhelm the senses. Balanced and in harmony, this is a solid example of a great California Cabernet that is drinking at its peak. Having tasted this wine young, while its calmed down since it was released, it has not gained much in complexty. There is no reason to hold off from popping a bottle. Spicy, espresso, cocoa and plummy fruits lead to a round, plush, but oaky, sweet, woody finish. This is fully mature. Not for the oak averse, you find black and blue fruit, espresso bean and earth on the nose. The wine is round, fat and ripe, with a sweet black and blue fruit with more than a hint of vanilla bean and smoke in the finish. Oaky, round, lush and sweet, with lots of ripe, sweet, juicy fruit, but even more wood. Oak averse tasters should not be drinking this wine. Licorice, coffee bean, smoke and jammy dark berries, big, rich and dense, with a dryness that was starting to appear in the end notes of the finish. I'd opt for drinking this sooner than later. This is a big wine. Massive amounts of ripe black and blue mountain fruit, oak and choclate are easy to find. With all its size, the wine remains balanced, finishing in blast of chocolate covered, ripe black fruit. Forest floor, tobacco and jammy berries open the aromatics, on the palate, the wine is, rich and dense, but the finish is starting to dry out. Ripe fruit. Powerful, slightly oaky. God balance with round textures and a long, black and blue fruit finish.